Mavis Robertson was a pioneer for the role of women in the superannuation sector. As one of the founders of Cbus, she stood at the forefront of the industry. Now, her name has been lent to a scholarship that offers students the chance to follow in her footsteps. To find out more, we spoke with the scholarship’s inaugural winner, Joanna John. Joanna John is in the third year of her Bachelor of Commerce, majoring in Actuarial Studies. 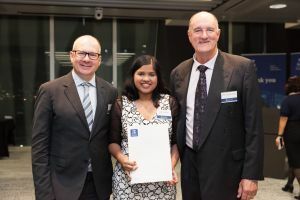 It’s a course of study that began with a high school talent for maths, (that eventually relocated her from Queensland to study at the University of Melbourne) but for Joanna, it’s much, much more. However, it wasn’t just the industry experience that drew Joanna to Cbus, and the Mavis Robertson Scholarship. For Cbus themselves, the scholarship offers an opportunity to celebrate the legacy of Mavis Robertson, and to encourage students like Joanna enter the field. Find out more about the Cbus Super Mavis Robertson Scholarship here.